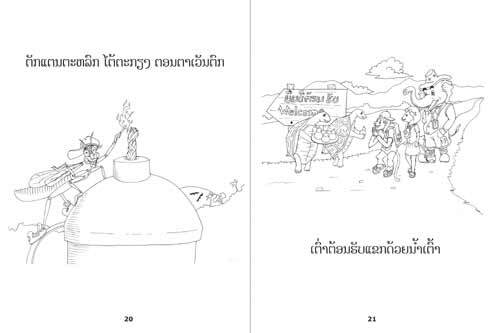 Funny Letters: A Lao fantasy alphabet book (Published in Laos). "These pictures were a lot of fun to color." How did a skirt-wearing rabbit, a kangaroo and a 2-wheeled cart get on the same page of this book? They all start with the same letter of the Lao alphabet. In this coloring book, Siphone has written a sentence for each letter of the alphabet, emphasizing words that begin with that letter. With Chittakone's captivating illustrations, they make an alphabet book that children will read again and again. Your donation of just $1,000 to $3,500 (US) makes it possible for us to publish a new book. 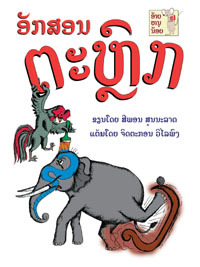 Find out more about encouraging literacy in Laos. Now it's fun to learn the Lao alphabet!